47,500 words and counting, that's how far I've got with writing and editing the sequel to Divide by Zero. My main character's finally told me how the story ends, so now I've just got to set all the pieces in place and avoid that insidious urge to race too fast to the finish line. When the author of Fezariu's Epiphany told me the title to his guest post today it sounded just perfect. He doesn't like sequels and I'm writing one. I'm also reading, of course, and have just finished reading his unsequeled novel, Fezariu's Epiphany. He's created a huge and fascinating world, filled with social and geographic history, great characters, curious nations and much much more. But perhaps I should let him tell you about it. 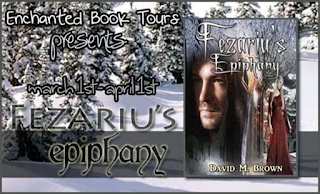 Click here for my review of Fezariu's Epiphany, and read on to learn of author David M. Brown's aversion to sequels. Thank you David for visiting my blog.